If you’re unsure whether Sustain-Innometer is the right assessment tool for you, please don’t hesitate to contact us, and we’ll give you a call to answer any questions you may have. Download your own printable edition of our information sheet to learn more about how it can add value to your business. 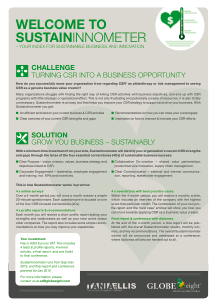 Clear Purpose - vision, mission, business strategy and objectives linked to your CSR-efforts. Corporate Engagement - leadership, employee engagement and training, incl. KPIs and incentives. Collaborative Co-creation - product/ service innovation, supply chain management, shared value partnerships. Clear Communication - external and internal communication, reporting and stakeholder engagement. RATE & IMPROVE YOUR BUSINESS. SustainInnometer is a self-assessment tool, which gives you a clear overview of your current corporate sustainability and responsibility (CSR) strengths and gaps. 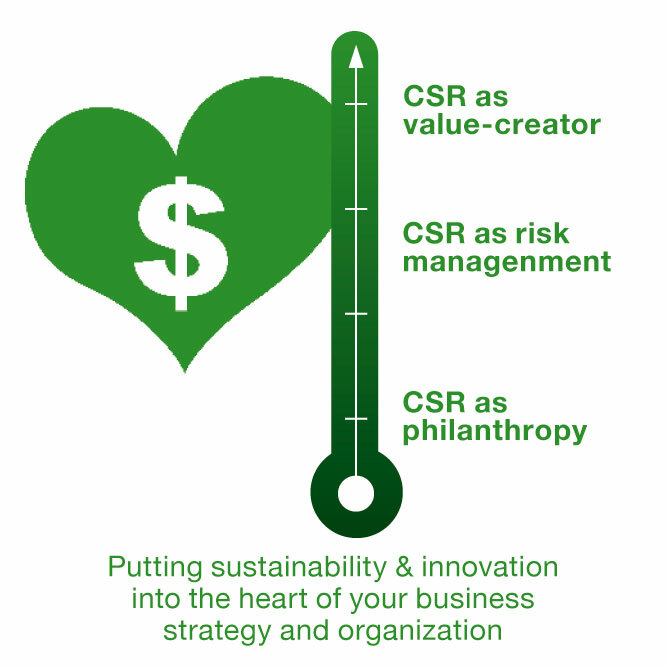 How do you successfully move your organization from regarding CSR (Corporate Sustainability and Responsibility) as philanthropy or risk management to seeing CSR as a genuine business value creator? Many organizations struggle with finding the right way of linking CSR activities with business objectives, and end up with CSR programs with little strategic or operational effect. This is not only frustrating and potentially a waste of resources, it is also totally unnecessary. SustainInnometer is an easy tool to help you improve your CSR strategy, so it supports and drives your business. With a minimum time investment from your side, SustainInnometer will identify your organization’s current CSR strengths and gaps through the lense of the four essential cornerstones (4Cs) of sustainable business success (see further description of the 4Cs in the left sidebar section). 4 x online surveys: Over a 4-month period you will once a month answer a simple 20-minute questionnaire. Each questionnaire is focused on one of the four CSR-focused cornerstones (4Cs). 4 x profile reports & recommendations: Each month you will receive a short profile report stating your strengths and weaknesses as well as your total score versus other companies. The report also includes some simple recommendations on how you may improve your capabilities. 4 x newsletters with best practice cases: Within the 4-month period, you will receive a monthly article, which includes an interview of the company with the highest score that particular month. The combination of your own profile report and the ‘best case’ articles will show you how you can move towards applying CSR as a business value creator. Final report & conference with diplomas: At the end of the 4-month period, a final report will be published with the overall SustainInnometer results, monthly winners, and key recommendations. The overall SustainInnometer winner will be announced and celebrated at a conference, where diplomas will also be handed out to all. This includes 4 tests & profile reports, 4 winner articles, a final report, and one ticket to the final conference. SustainInnometer runs from September – December 2013, and final report and conference are planned for January 2014. If you need more information, please don’t hesitate to contact us at ad@globeeight.com, and we’ll give you a call to answer any questions you may have. SustainInnometer is co-developed and co-promoted by GlobeEight® and TANIA ELLIS – The Social Business Company®.